Rome - GIAHS, a global initiative with clear goals: to valorise special agro-silvo-pastoral systems around the world that testify to the ingenuity of man’s adaptation to the environment, and that express the richness of biocultural diversity and the relationship between man and nature. But also to provide support to local communities through the promotion of agricultural products, support for sustainable tourism, the enhancement of historical and artistic heritage and the conservation of biodiversity. 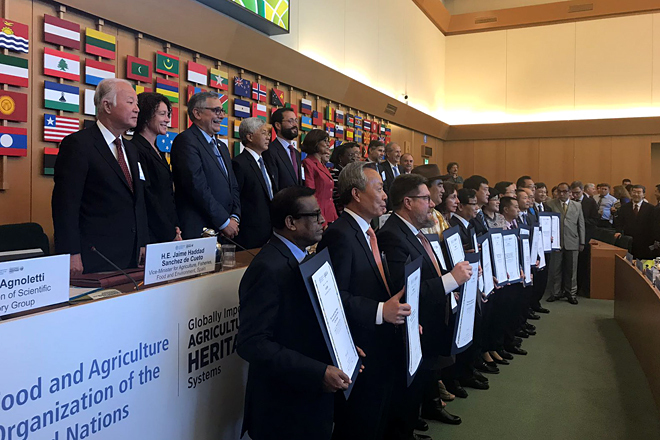 These are the cornerstones of the FAO GIAHS programme - Globally Important Agriculture Heritage Systems, a network which currently has 50 protected areas in 20 countries and which can also count on the support of our Agency. 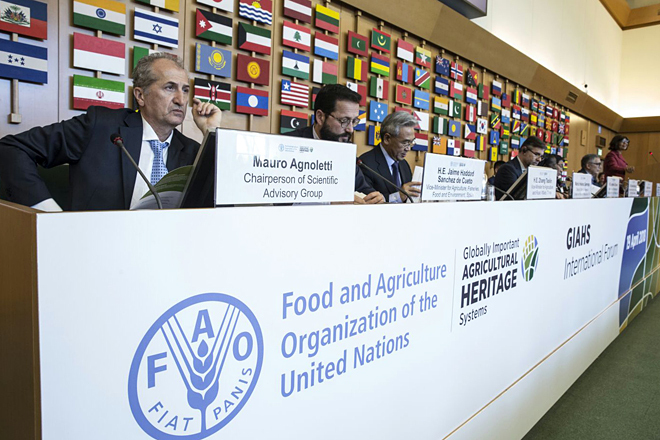 On 19 April, the International Forum of the GIAHS network was held at FAO headquarters. Delegates from all continents took part in the event and, through their extremely varied experiences, bore witness to the wealth of knowledge accumulated by farmers over thousands of years of coexistence with their territories. 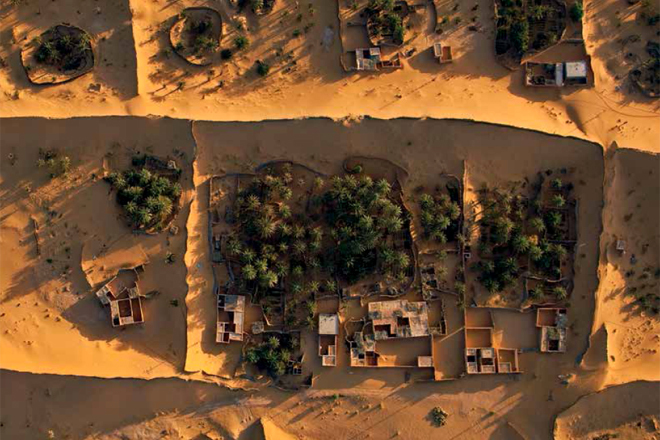 As an example, the benefits provided by Ghouts in the Algerian desert were analysed: these are small oases, excavated without the use of mechanical methods, by harnessing the wind. They are currently threatened by the introduction of modern techniques of water extraction and over-exploitation. Also examined was the Oldonyonyokie and Olkeri agro-pastoral system in southern Kenya, where Masai ethnic groups have organised a society where shepherd-based agriculture coexists with wildlife conservation. 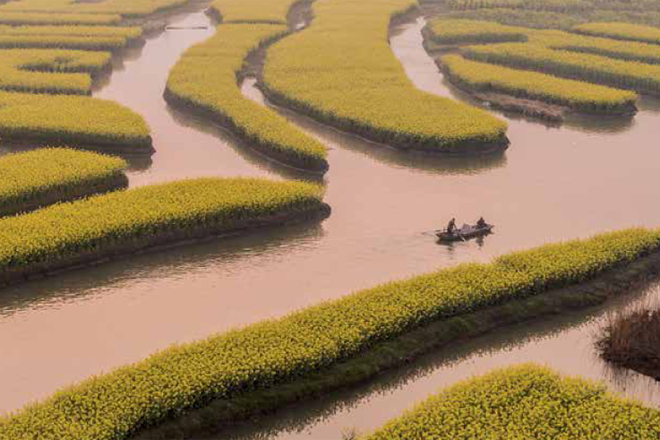 During the forum, 14 new sites on the GIAHS list, were presented and awarded prizes, including the Chinanpa floating cultivation system in Mexico City, documented long ago by Cortés on his entrance to the Aztec capital Tenochtitlan, plus the traditional Wasabi cultivation system in Japan and the mixed system of fish production and mulberry cultivation in Hazou, China. Italy participated through an address by its Deputy Minister of Agricultural, Food and Forestry Policies, Andrea Olivero, who offered a detailed description of the AICS project "Building capacity: international advanced application courses on GIAHS for the assessment of resilience in three different social and environmental contexts with bio-cultural activities in Africa, Asia and Latin America." The three-year initiative features an overall commitment of 2 million Euros, and is managed by the Department of Agriculture and Forestry Systems Management of the University of Florence and involves the creation of an international training centre for the entire GIAHS programme. The training programme, which will be launched at the end of the year, will be divided into various 8-month multidisciplinary courses and will be aimed at operators from ministries, local authorities and NGOs in countries that are priority for the Italian Cooperation Agency. The project also envisages the identification of 3 potential new GIAHS sites in three priority countries, with the aim of strengthening and integrating the action of AICS in the sectors of sustainable tourism, food security and the resilience of local populations.